QMiner is a data analytics platform for processing of large-scale real-time streams containing structured and unstructured data. It implements a comprehensive set of techniques for supervised, unsupervised and active learning on streams, which can be connected to imported data streams. Please check QMiner homepage for more details! OntoGen is a tool for interactive topic ontology construction. It gets a collection of text documents on the input and uses it to help the user construct a topic ontology. The user can created topics, organize the topics into topic ontology and assign the documents into topics. It uses machine learning techniques to help user at discovering, creating and naming topics. Please check OntoGen homepage for more details! Document Atlas is utility for visualizing large corpora of text documents. The whole corpus is projected onto a 2D plane using a combination of latent semantic indexing and multidimensional scaling. The user can explore the 2D plane using an intuitive interface. The density of documents is used for generating the background relief in order to make the visualization of documents similar to a map. Keywords describing specific areas are also written on the map. All these features together provide the user with an easier path towards understanding the corpus. 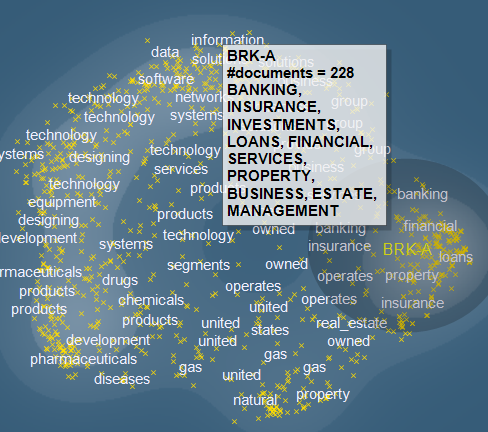 Upper screenshot shows a visualization of Reuters articles from 1997 containing keyword "Slovenia". One can see from the visualization that Slovenia appeared in the articles related to sports (upper left, showing also an extended list of keywords for this area), economy (upper right), international politics with focus on European Union and NATO (bottom left) and internal politics (bottom right). For more details on how to read the visualization, check the publications. Please check Document Atlas homepage for more details! Toy example showing the working of the binary SVM classifier in two dimension using linear, polynomial or Gaussian kernel. The SVM engine used is the one from Text Garden.